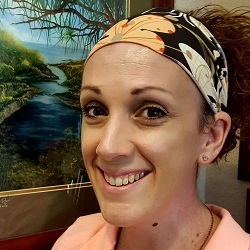 My name is Jessi and I am a Licensed Massage Therapist (LMT). My approach to massage therapy values my clients input and communicating how I can help them to form a treatment plan that is in their best interest. With my knowledge of the human body and massage application, combined with great listening skills we can create your ideal Hawaiian Experience. I am looking forward to working with the entire Hawaiian Experience Spa ‘ohana, that includes you! I grew up in Canada and moved to Arizona my senior year of high school. I attended Agua Fria Union High school and experienced life as a University of Arizona Wildcat vicariously through my husband (Go Cats!). We have two beautiful and energetic children, one boy and one girl who add the perfect balance and complete our family. Our journey has taken us to different areas of the valley and has now come full circle. We have recently moved back to the west side of town and I am honored to be practicing my skill set close to home with Hawaiian Experience Spa. My massage training started in Tucson Arizona at The Desert Institute for the Healing Arts (Now Cortiva –Tucson) where I enrolled in their Extended Massage Therapist program consisting of over 1000 hours of training graduating in 2001. My educational path during school focused on Sports Massage and Clinical hours supported by Anatomy/Physiology, Pathology, Swedish and Deep Tissue Massage, Myofascial work, hydrotherapy and Kundalini Yoga. I have continued to hone my craft by taking continuing Education courses such as Table Thai Massage, Hot Stone Massage, Prenatal massage and Trigger Point Therapy. I have worked in a Chiropractic office and with spas and resorts around the valley while maintaining a small private practice. My on the job experience in the spa industry has also given me the opportunity to learn additional treatments such as body wraps and sugar/salt scrubs. Let’s get a treatment plan started because your body deserves to be happy! Jessi is the leader of team Shaka, which is a traditional Hawaiian sign given as a greeting.